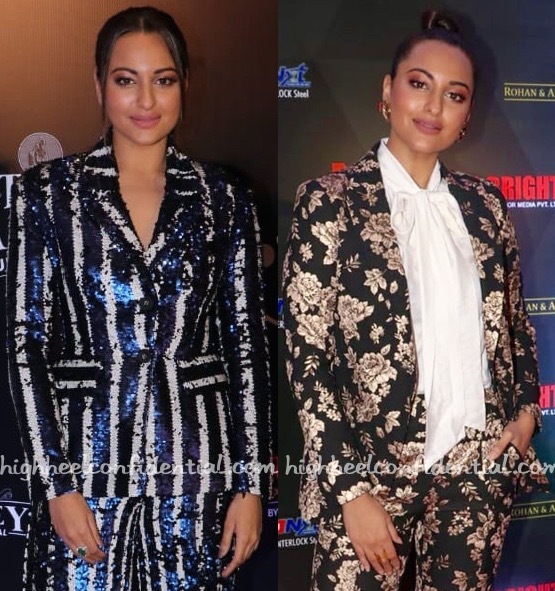 Sonakshi took to the red carpet last night wearing pantsuits. She teamed both the sequin Dhruv Kapoor one and the floral Michelle Mason separates with Jimmy Choo pumps. Which do you like her more in? Oh dear – what a disaster that blue sit is. Although it does make her legs look super long. The floral suit is better. At least the shirt balances out all that print. Seems Ranvir Kap has influenced some women to dress like jesters. This is so unfair to Ranveer.. anyone who dresses clownish is becoming synonyms to Ranveer! The blue suit is missing stilts. And too much bronzer in both the looks. The second suit although busy is a tad bit better. Good Heavens! Maa Eyeees…. One is too clownish and the other one too “Torero-ish”! 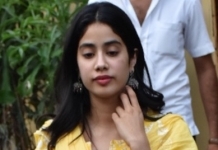 And this is the lady who whispers in reporters’ ears to call her fashion designer!! Blue suit is giving strong piñata vibes. Downright clownish! Esp the blue one. Black floral outfit looks like upholstery.